It doesn’t feel like late October outside (72 degrees yesterday, can’t complain!) but it sure looks like fall. The trees are lit up in yellow, orange and red and leaves are swirling around in the streets. This year, like every year, I’m feeling conflicted about the falling leaves—simultaneously sad to see them go, but awe-struck by their blazing glory on the way down. Sweaters and scarves and holiday cheer will be here before we know it. 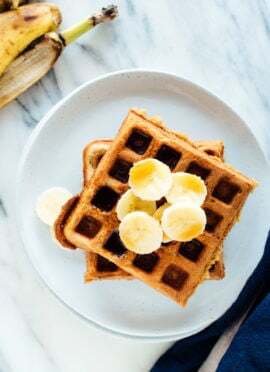 I partnered with Grain Foods Foundation to bring you these oat flour-based pumpkin waffles, which would be a fun breakfast to serve on Halloween, Thanksgiving, Christmas or any weekend from now until then. These waffles freeze beautifully, too, so you might want to make a big batch and treat yourself to pumpkin waffles are busy weekday mornings. Just pop them in the toaster and you’re good to go! 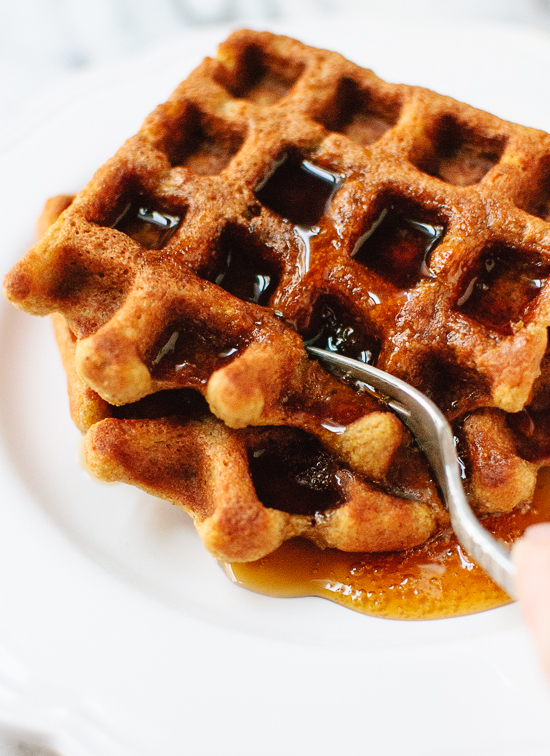 These whole grain pumpkin waffles are a riff on my basic oat flour waffles recipe. “Basic” doesn’t begin to do them justice—these waffles are crispy on the outside, fluffy on the inside, light but hearty, and hold me over until lunch time. In other words, they are basically perfect. I know a few commenters who can back me up on that! It took me a few tries to get the ratio of liquid/fat/pumpkin just right for these waffles, but I finally nailed it with the version below. Don’t worry if you don’t have oat flour in your pantry. 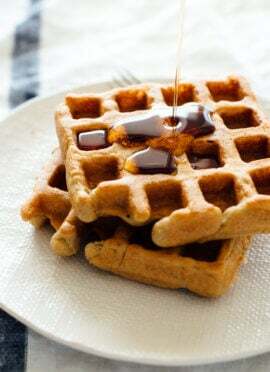 You can easily make your own oat flour in a blender or food processor, like I did for these waffles. See my recipe notes for details. Grain Foods Foundation would like to remind you that you can find more information and recipes for grain foods on their website, grainsforyourbrain.org. I’ll also be posting more holiday recipes with whole grain goodness like pasta, rice and whole wheat flour. What holiday recipes are you looking for this year? These delicious, gluten-free pumpkin waffles are crispy on the outside and fluffy on the inside. 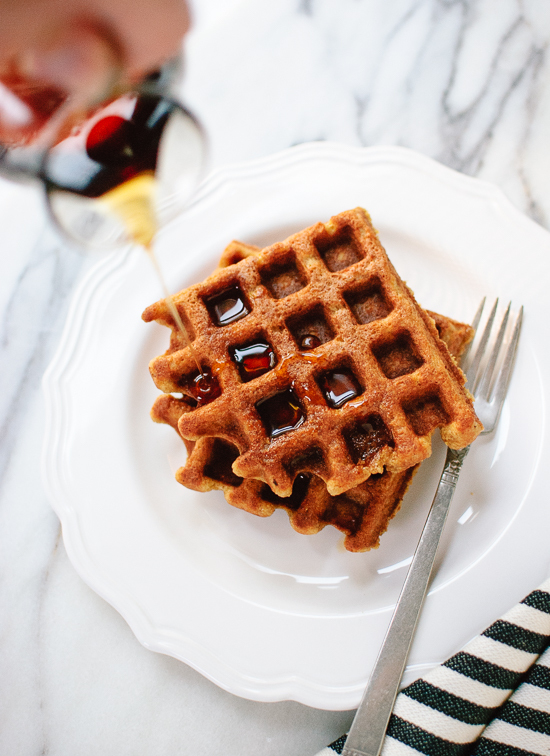 This pumpkin waffle recipe’s secret ingredient is oat flour! You can easily make your own oat flour at home (check the recipe notes for details). 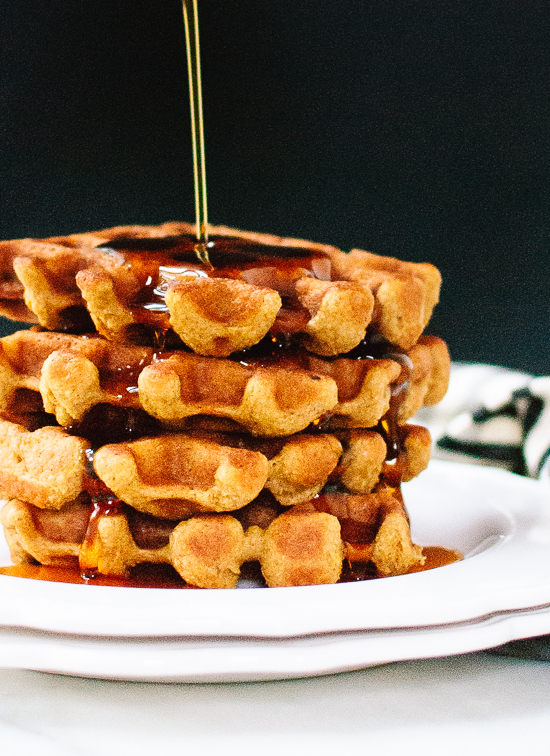 This recipe yields 4 round, 7-inch Belgian waffles. Note: when I say “scant,” I mean just a couple teaspoons shy of the measurement listed. Once 10 minutes is up, give the batter one more, gentle swirl with your spoon. The batter will be pretty thick, but don’t worry! Your waffles will turn out great. Pour batter onto the heated waffle iron, enough to cover the center and most of the central surface area, and close the lid. 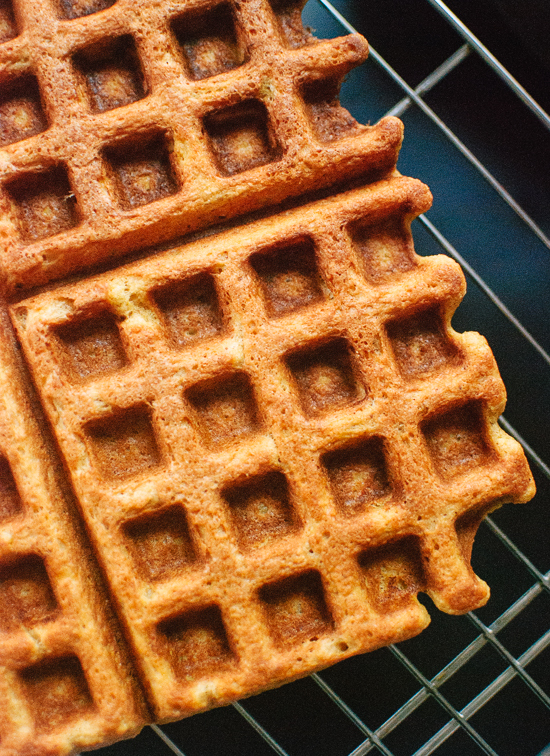 Once the waffle is deeply golden and crisp, transfer it to a cooling rack or baking sheet. Don’t stack your waffles on top of each other or they’ll lose crispness. If desired, keep your waffles warm by placing them in a 200 degree oven until you’re ready to serve. Repeat with remaining batter and serve with desired toppings on the side. Recipe adapted from my gluten-free oat waffles recipe. *Make your own oat flour: Simply blend old-fashioned or quick-cooking oats in a food processor or blender until they are ground into a fine flour. You’ll need to blend about 2 ¼ cups oats to make 2 ¼ cups flour. *A note on gluten free oats: Be sure to buy certified gluten-free oats or certified gluten-free oat flour to ensure your waffles are gluten free. Freeze it: These waffles freeze beautifully. Just store in freezer-safe plastic bags and pop individual waffles into the toaster until warmed through. 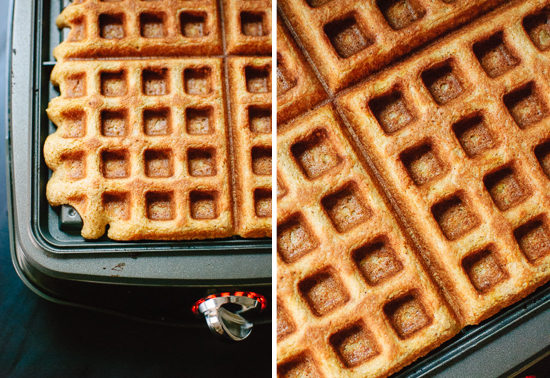 Recommended equipment: This fancy-pants non-stick waffle maker. I love that it has a large cooking surface, which means I can cook an entire batch of waffles with just two presses. 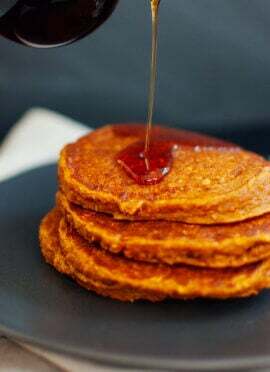 More pumpkin recipes: Check out my gluten-free pumpkin oat pancakes, vegan pumpkin pecan scones and maple-sweetened pumpkin muffins. Disclaimer: This post is sponsored by Grain Foods Foundation and I received compensation for my participation. Opinions are my own, always. Thank you for supporting the sponsors who support C+K! Tried this recipe today and it turned out delicious! I used a little bit more pumpkin 1/4 cup – to use up what I had on hand, and threw in a tbsp of flax seeds for extra health. My batter was a little difficult to spread out quickly enough, so i may try adding extra milk next time. Great! 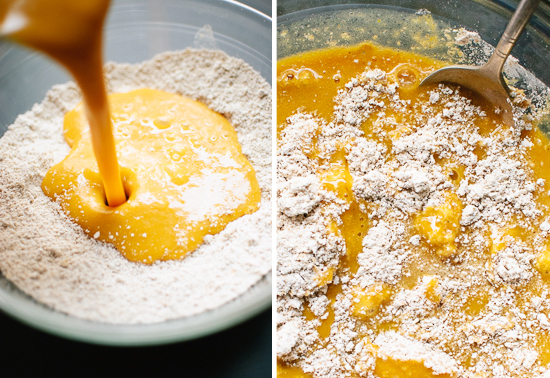 Your batter is likely thicker with the extra pumpkin and the flax seeds, so your thought on adding a little more milk would help to make the consistency less thick. Be careful not to add too much! I made these tonight and they are easy and fantastic! I loved the little bit of zing from the ginger. This recipe is a keeper for my family. Loved it! Could make 16 small waffles of 95kcal each! Toppy! Replaced oats by whole wheatflour, honey for maple syrop and butter as alternative for the coconut oil. Thanks, Anna for the review! Delicious and perfect texture! I used my blender to mix the wet ingredients, and made these as Belgian waffles. I didn’t have maple yrup so I used 2 Tbsp molasses and 1 Tbsp local honey. My 3 year old and I loved them! We served them with butter and cinnamon sugar on top. Thanks for sharing, Sarah! I appreciate the star review. I’m sorry if this question has already been asked/answered, but when you say pumpkin puree, does that mean a normal can of pumpkin? Is that “puree”? This is the first time I am commenting, but my husband and I love your blog, and your cookbook! We have been followers for over a year now. My husband decided to become a vegetarian in January 2017, and he’s still going strong. I LOVE eating vegetarian at home, too. We make the BEST meals. All thanks to you, Kate. Thank you for helping us on this journey to cook great, healthy, nourishing, delicious meals. Great question! Yes, canned pumpkin. Or, you can make fresh. But I used canned for this. Thanks for your support. :) I love to hear from you. Thank you, Taylor for the review. This was SO fabulous! I used 1 1/2 cups of fresh, homemade baked pumpkin and used less milk. My father, who usually barely eats one pancake, at an entire Belgium this morning. #success Thanks so much! Love the hashtag, Anna! Thank you for your review. These are fantastic! My 2-year-old is working on her 2nd waffle right now! Love that! They are delicious. I appreciate the review, Sarita. I love pumkin waffles but my husband thinks they could be fattening. Is that true? I wouldn’t think of these as fattening. Of course, moderation and what you put on them. Hope this helps! My 2 year old loves these waffles! So much so that I make double batches and freeze them for her breakfast during the weekdays when we are short on time in the morning. I just make the waffles smaller, measuring them out with a large cookie scoop. They turn out to be the perfect size for her and look like snowflakes:) Thanks! I just made these waffles. Delicious!!! we all loved them. The texture is beautiful in the inside and the outside. I topped with with pure maple syrup, bananas and chopped walnuts. I felt they are crispier than the non-pumpkin gluten free waffles, which I also love! We will definitely be making this during the fall. I love how you talked about the texture! I think so too. Thank you for sharing, Marisa. 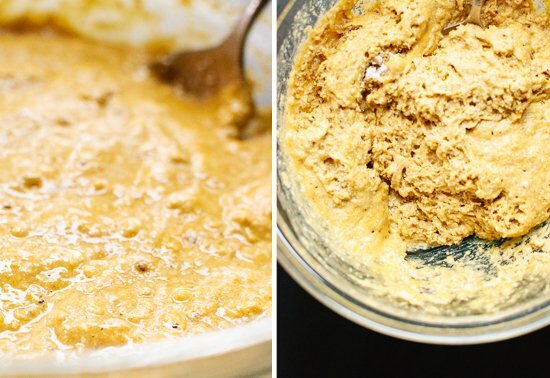 I love the original version of this recipe and I’m making these today, but I can’t figure out if you used pumpkin puree, or solid pack pumpkin! Since the liquid ratio could be way off if I use the wrong one, I’m hesitant to just guess. If you could let me know, that would be amazing! Best waffle recipe ever! Seriously perfect balance of flavors. Much more robust and sustaining than standard flour waffles. I’ve told all my family and friends. Thanks for spreading the love! I appreciate it. These are wonderful. My husband has to be on a no fat diet so I substituted applesauce for the eggs, and agave for the maple syrup bc I didn’t have any. I used nonfat milk as well and I cant believe it’s not butter. They came out wonderful. Great to hear they worked so well with your substitutions! I made these this weekend and we loved them so much that I’m making a big batch to freeze now. So good!! Love that, Brynn! Thanks for your review! These where wonderful, I just switched the eggs for flax eggs.They came out great! Great to hear! I really appreciate the review. made these this morning and blended my own oats. they were good but a little crumbly – maybe because my oats weren’t industrial powder? also not creamy on the inside. Made exactly per recipe. I’m sorry to hear that, Suzanne! Key to this is making sure the oats are finely blended and aren’t grainy. It helps the texture and to ensure the liquid soaks up correctly. Hope this helps! These are amazing and reheat beautifully in the toaster oven!! Will be making more batches to freeze and share with friends! I like topping them with maple syrup, pecans and bananas but they may also be good with topped with some almond butter if you’re looking for extra protein! These waffles are amazing, I’ve made them two weekends in a row. For my personal taste the spices were a little much the first time so I doubled the recipe this week except for the ginger, nutmeg, and allspice and it was perfect! Thank you so much for sharing! Thank you for sharing, Kayla! Love this as a breakfast for dinner option! I love breakfast for dinner! More than I probably should. Thanks for sharing, Maggie! them! Thanks for such a great recipe. Definitely a keeper. I made this pumpkin waffle recipe. It was delicious! I made a few changes the second time I made it. I doubled up the cinnamon and vanilla and I used 1 teaspoon baking soda and 2 teaspoons baking powder instead of 1 tablespoon baking powder. It came out light and crispy on the outside and soft inside!! These are great! Made them and stored in fridge, popped them in the toaster to heat for breakfast. My husband loved them as well and he is a picky one when it comes to my cooking new recipes. I’ve tried several similar but this one is going to be mine to keep as the texture is absolutely perfect. 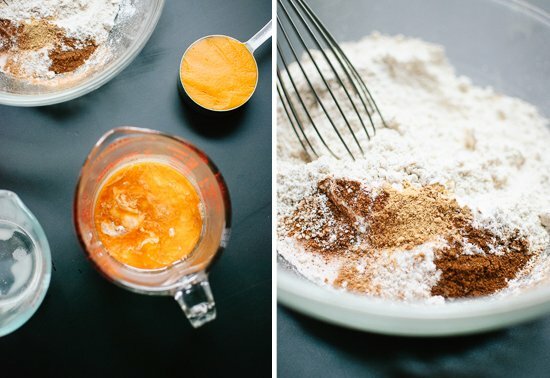 Is it possible to use whole wheat flour? So I thought I could substitute the oat floor for gluten free flour (no oat flour on hand and my food processor was dirty from last nights dinner) – huge mistake. They were perfectly fluffy and beautiful but unfortunately tasted like straight cardboard. However, I was determined… so I followed the recipe as I should have in the first place ;) and they were AMAZING. This is the second time I have made them actually. Just wanted to share with everyone my experience with gluten free flour! I’m sorry they didn’t turn out! I’m glad you tried them again though, and loved them! I made these this morning. I changed out the flour to make them Keto to a mix of Carbalose, almond flour, lupin flour, and oat fiber. I used heavy cream and added just a few drops of stevia. They are good! Nice and crunchy on the outside and tender in the middle. I will up the pumpkin and cinnamon next time as I think they could use a tad more flavor but, I love a lot of cinnamon! The different flour could have contributed to this as well. I have wonderful quick breakfast in the freezer for work week! Thanks for sharing your variation, Grovia!